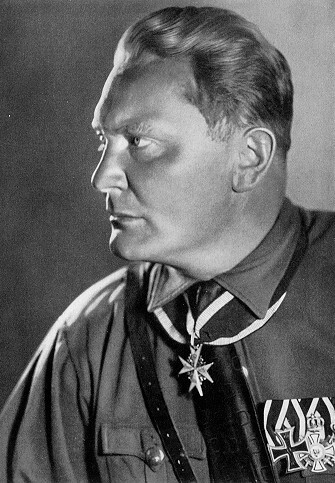 Hermann Göring, Commander-in-Chief of the Luftwaffe, President of the Reichstag, Prime Minister of Prussia, Plenipotentiary for the Implementation of the Four Year (economic) Plan, and designated successor to Hitler. In 1933, Göring created the secret state police, the Gestapo, that would later by taken over by Himmler and terrorize the continent of Europe. Following Kristallnacht in Nov. 1938, Göring fined the Jews one billion marks for damages which the Nazis themselves had inflicted. He also warned of a "final reckoning with the Jews" if Germany should get involved in war, a sentiment also repeatedly expressed by Hitler. Following the start of the war and early Nazi military successes, Göring ordered SS leader Reinhard Heydrich in July of 1941 to begin preparations for a "general solution of the Jewish question" in conquered territories. This led to the Wannsee Conference in Jan. 1942 in which Heydrich and Adolf Eichmann of the Gestapo attempted to coordinate the extermination of the 11 million Jews of Europe and the Soviet Union. Assuming the Nazis would defeat the Soviets, Göring was involved in post-war plans for the Soviet Union which included massive reduction of Slavic populations through famine deliberately inflicted by the Nazis. This would occur as food supplies were diverted into the Reich and would likely result in the deaths of "many tens of millions of people." Those areas in which the populations had been decimated would then be resettled by ethnic Germans, in accordance with Hitler's policy of increasing Lebensraum, or living space, for Germans at the expense of other nations.